The queue for immigration at Marrakech Menara Airport snakes back to the walkways that lead to the aircraft gates. There’s a VIP line, which comes with its own host to see you through the process without the pain, but it’s just as chaotic. Well spoken mums hush their blubbing kids and irritable fathers begin to protest the delays. A man called Monty barks into his mobile phone at some poor hotel receptionist to complain about the service that he’d apparently paid an arm and a leg for, but this just makes the border guards stamp passports even slower. 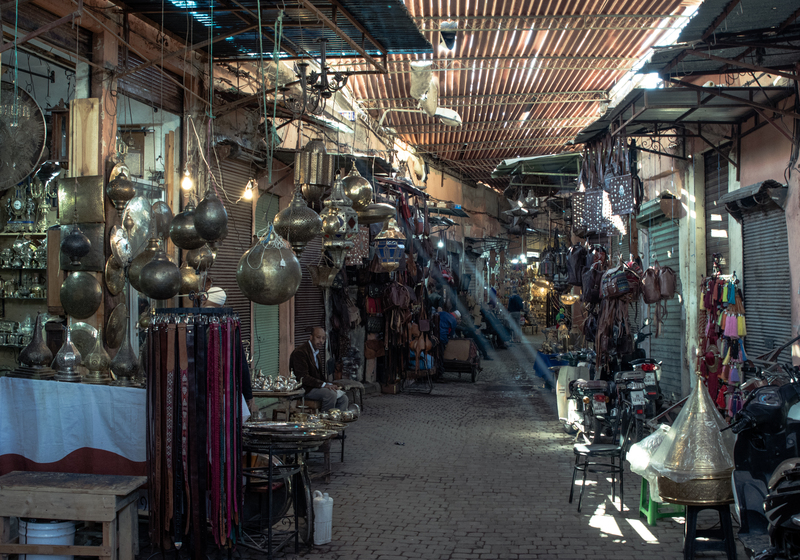 Welcome to Morocco: a place that is only a four-hour hop from most UK airports but a destination that feels about as alien to most holidaymakers as it gets. 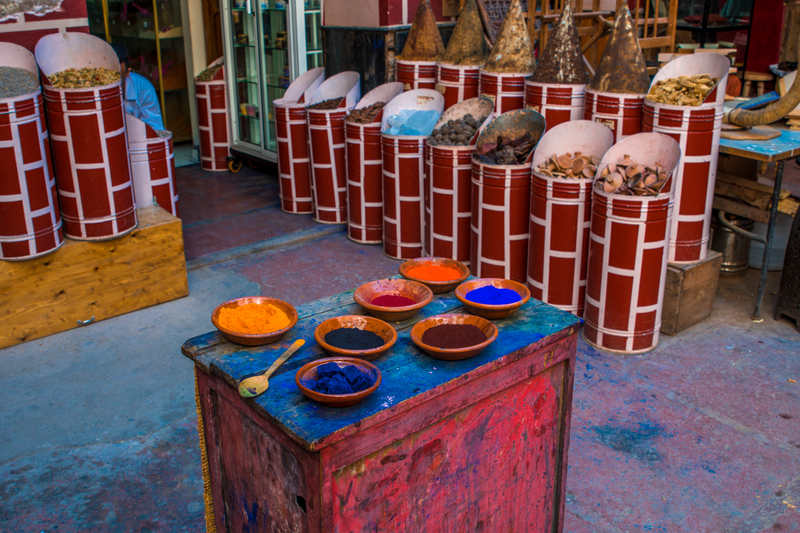 The Red City has long been popular with artists, bohemians and trendsetters, thanks to its vibrant visuals and energising spirituality, but wealthy holidaymakers in search of a pampering getaway have also adopted it as their own in recent years. It is half term and the calibre of folk dragging their brood for a final slice of winter sun ranges from ‘posh’ to ‘probably related to royalty’. Enjoying the decadence of a riad doesn’t come cheap. I’m finally called forward and deliberately avoid using the word ‘journalist’, but still receive a lengthy shakedown due to the fact that my backpack is stuffed with camera equipment. “Do you have a drone? Do you know what drone is? You plan to use a drone?” the security guard manning the x-ray machine says decidedly close to my face. I don’t have a drone but apparently some filmmakers decided to nab some aerial footage of the residence of King Mohammed VI a few years back and, quite unsurprisingly, the country has been vehemently against the flying devices ever since. But this verbal beating in a very sweaty airport is just the beginning of the challenge, as some of the most demanding off-road driving I’ve ever experienced is on the cards tomorrow. Owned by horse-mad Saida and Abdeslam Bennani Smires, the resort, which was designed by architect Jacques Garcia, sits at the foot of the Atlas Mountains and feels as if a royal family willed it into existence. 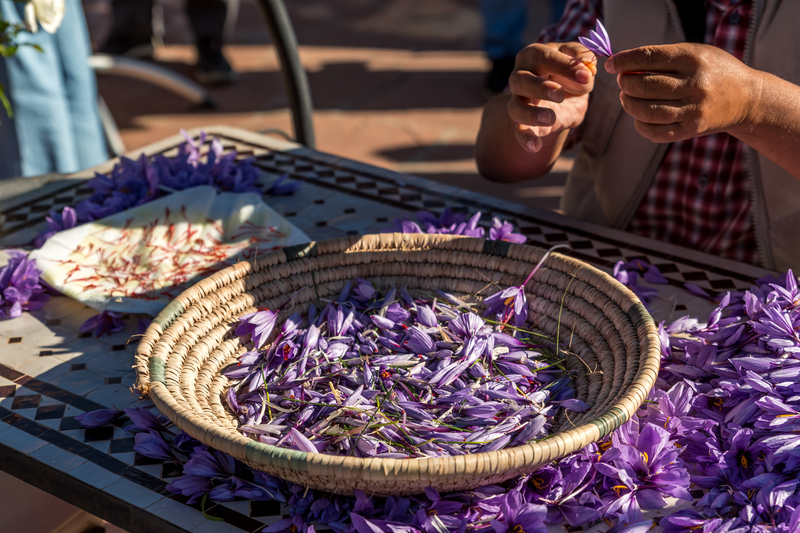 From the cool and beautifully tiled courtyard gardens to the exotic open stables that house dozens of Arabian thoroughbreds, it oozes luxury and offers an oasis of calm on the outskirts of buzzing Marrakech. Anyone used to the smooth surfaces of a British motorway would likely describe the road ahead of me right now as a ‘dirt track’. 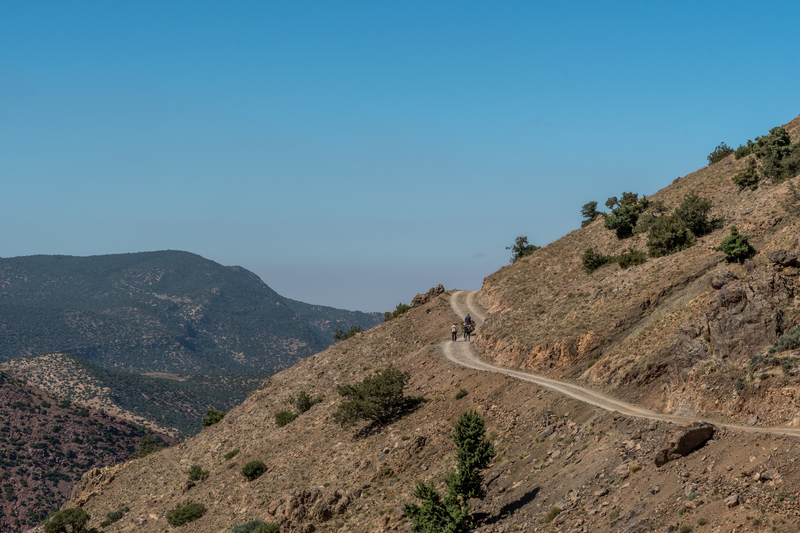 A dirt track that just so happens to cling to the edge of a perilous cliff edge that hovers above a decidedly deep and craggy ravine. 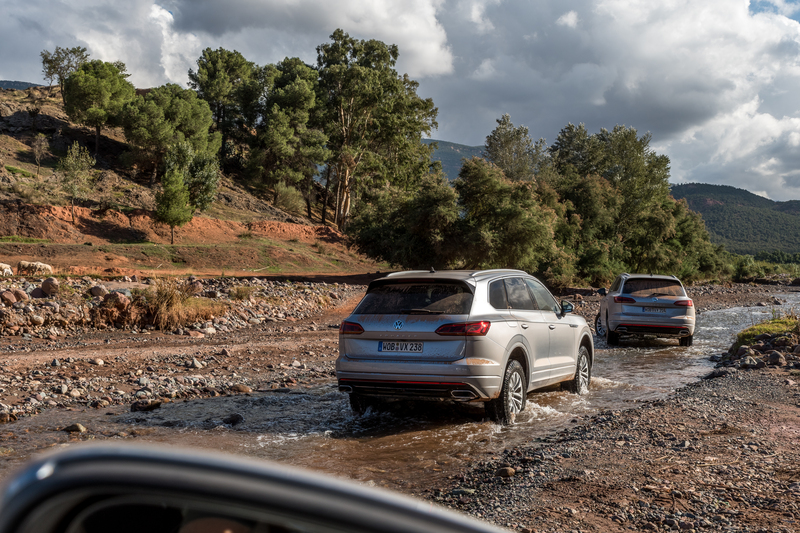 “This is like the autobahn compared to some of the roads we are about to drive on,” exclaims my off-roading colleague in his thick German accent. The word ‘roads’ accompanied by elaborate air quotes. Rewind a few hours and we were stood in the hotel’s courtyard, the early morning sun bursting over the Atlas Mountains and bathing the stone in a vivid red light. Stare at the surrounding landscape long enough and you’d be forgiven for thinking you’d landed on Mars. The box fresh, steely grey Volkswagen Touareg sat idling in front of us, standing tall on chunky off-road tyres, its ultra-bright LED headlamps cutting through the early morning mist. 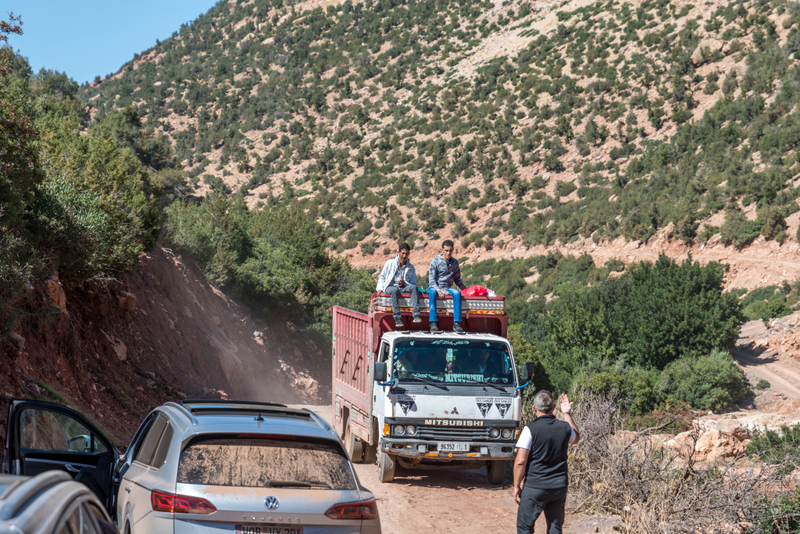 After inching out into the morning rush hour mayhem, we breezed through schools of beeping scooters, pointed the nose of the big SUV towards the P2024 and made a beeline for Toubkal Mountain – the highest peak in North Africa. During winter months, this area plays host to a few ardent skiers, but there’s little in the way of facilities or apres-ski… just a rickety looking chair lift that zig-zags up the piste. The roads up until this point have been fairly challenging but have at least resembled roads. 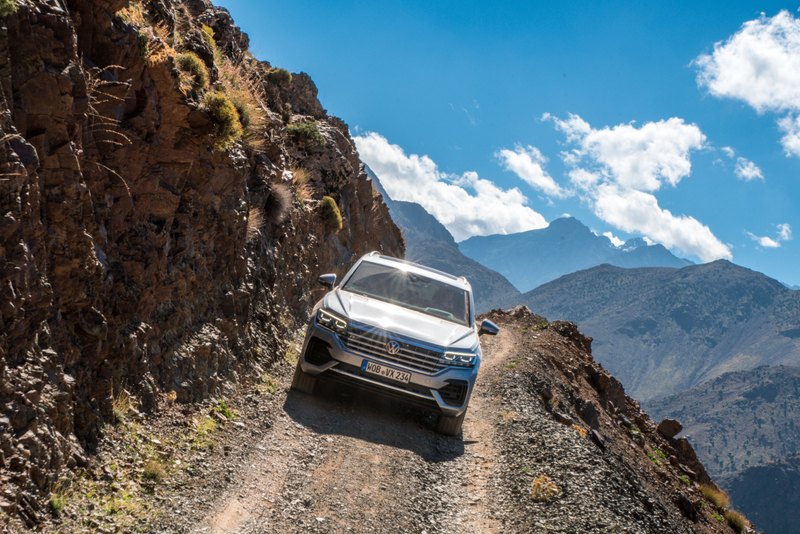 From our vantage point at this impromptu off-road playground, it is clear things are about to get a lot harder. Hence the elaborate German air quotes. To make it to our planned stop at Sir Richard Branson’s super exclusive Kasbah Tamadot (which he apparently fell in love with on one of his ballooning expeditions), we would have to work for our lunch and traverse a route only the odd local frequents. We push on the dirt path that hugs the mountainside and ribbons down towards sea level, before turning on itself and scampering back up again. The landscape miraculously changing with every corner – bright red rock occasionally giving way to Alpine-esque vegetation, which morphs into bright turmeric earth and transitions back to terracotta again. The route isn’t long but it is slow and arduous, the occasional delivery lorry laden with people and goods forces us to stop, reverse, turn and mount the hillside in order to let it pass. 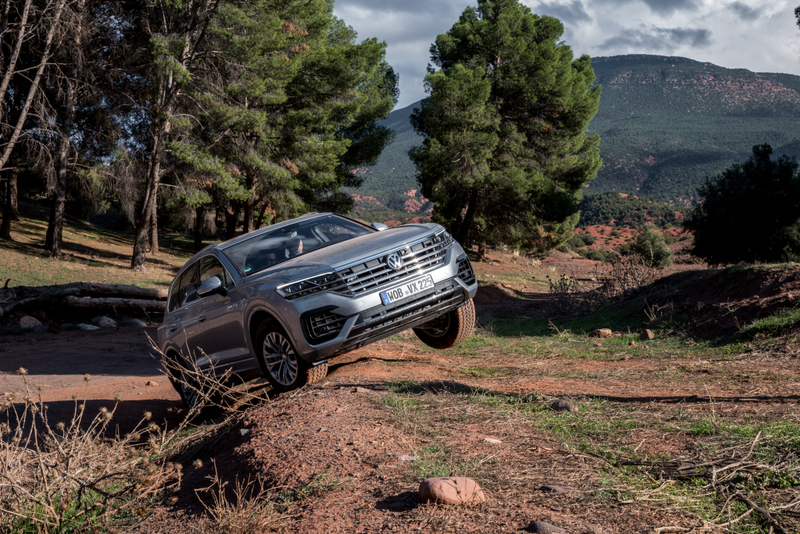 But with its beefy 3.0-litre V6 turbo diesel engine and staggering 600Nm of pulling power, there’s not much that fazes the Touareg, which manages to take this route in its stride and flatten every unexpected hazard. 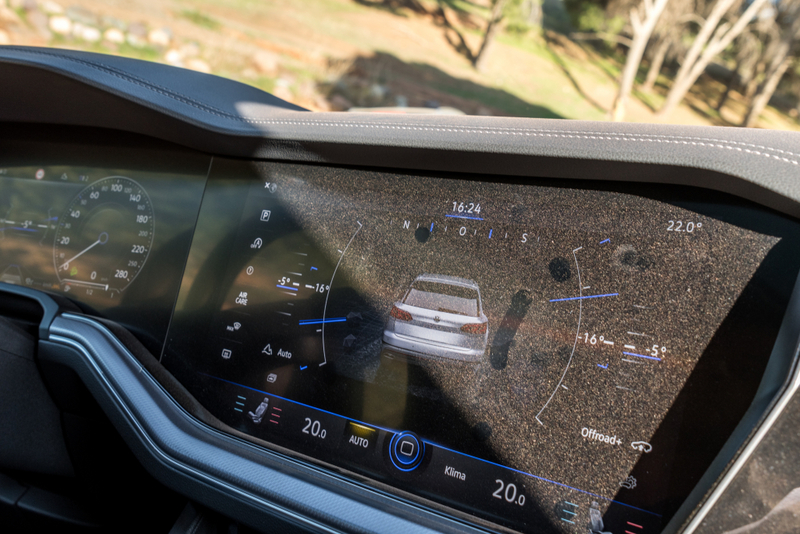 We continue to slowly pick our way over stray boulders – the optional metal bashplate doing its best to protect the delicate underbody – round hairpin bends, ignore sheer drops, power up insane gradients and force the big VW into ludicrous lean angles that the digital displays vividly portray via crisp computer graphics, but it handles it with minimal fuss and maximum comfort for all passengers. Children run along side the windows as we pass through the tiny villages of Tamatert, Amssakrou, El Bour and Tansrat, the Touareg’s futuristic styling clearly a hit with the locals. Several hours later, we wade through a shallow river and cross the valley to the 28-room Kasbah Tamadot, which sits majestically on the edge of rich red hillside, and offers some great views out across the valley. 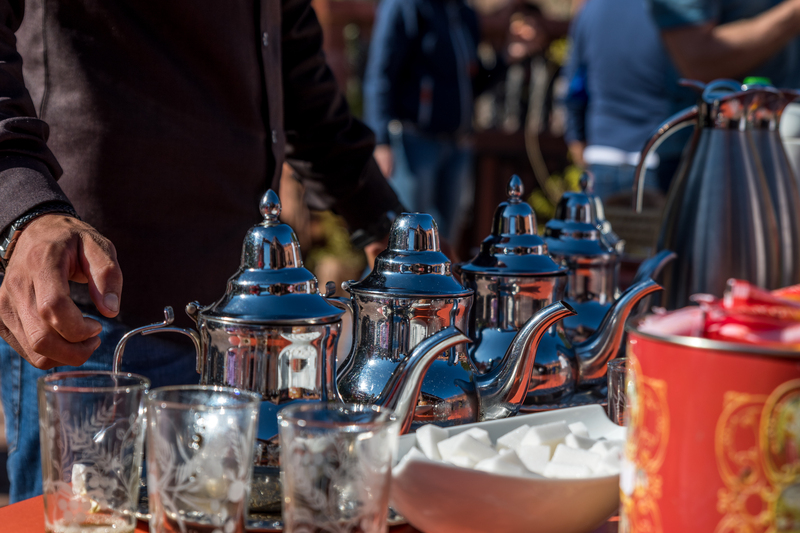 Its chefs prepare a feast of steaming tagine, flatbreads and spiced kebabs, which are enjoyed with more sweet tea while the cool mountain breeze takes the edge off the hot afternoon sun. 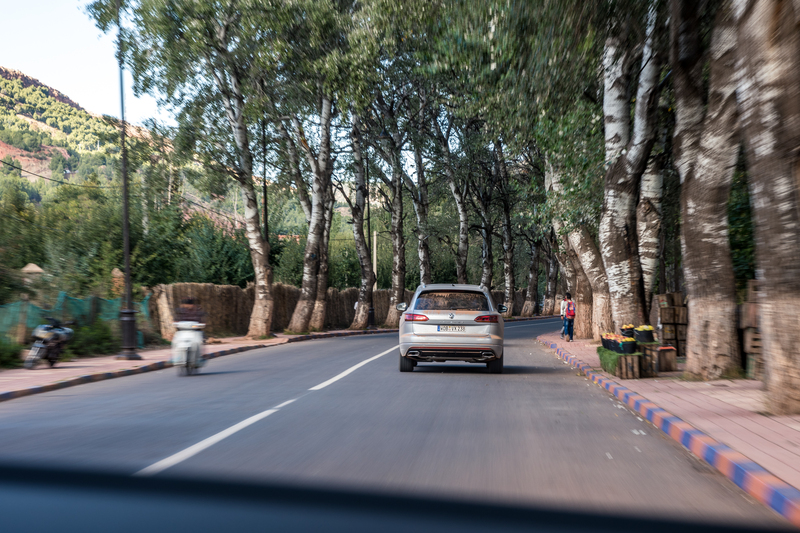 After a brief diversion to one final off-road playground, where we can nerd out over axle articulation and get excited about lean angles, we hit the tarmac and cruise back into Marrakech. As dusk descends, there is time to walk the freshly paved streets of Avenue Echouhada, which houses some of the newest and largest nightclubs in the region. More food is consumed at the Comptoir restaurant, which neatly blends Moroccan tradition with modern cocktails and noisy entertainment that draws a fashionable crowd. 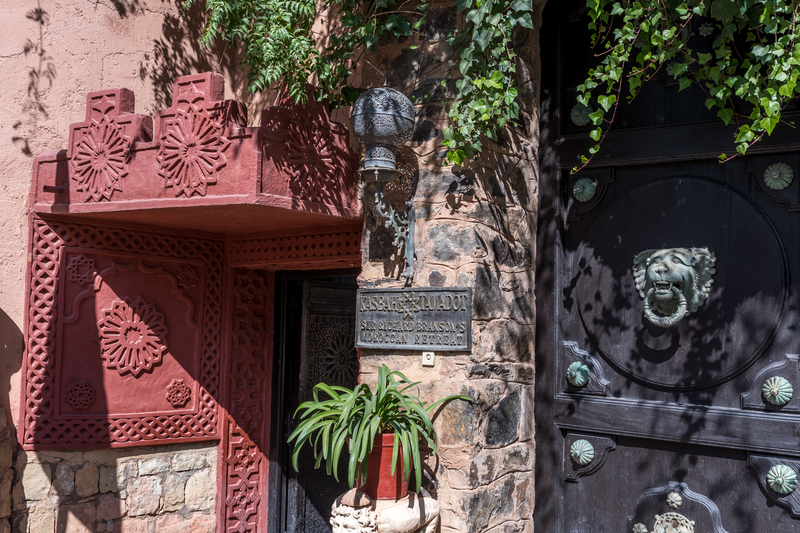 Situated at the foot of the Atlas Mountains, hugging the edge of a picturesque valley, the Kasbah Tamadot is Richard Branson’s first choice of residence when bunking down for the night in Morocco. With 28 rooms and some staggering architecture, the resort is the choice of the flush traveller looking for the ultimate in luxury, but also makes a nice lunch stop when out exploring the mountains. It is essential you make a reservation if not staying as a guest, so check the website. 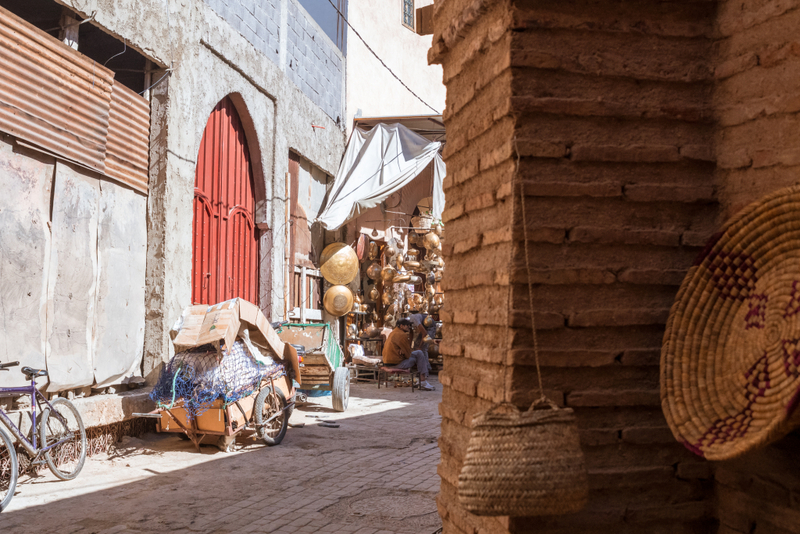 It’s easy to see why holidaymakers flock to the city for some winter sun – Marrakech is exotic and invigorating without being so alien that you can’t enjoy a cup of Starbucks coffee if Western cold turkey kicks in. 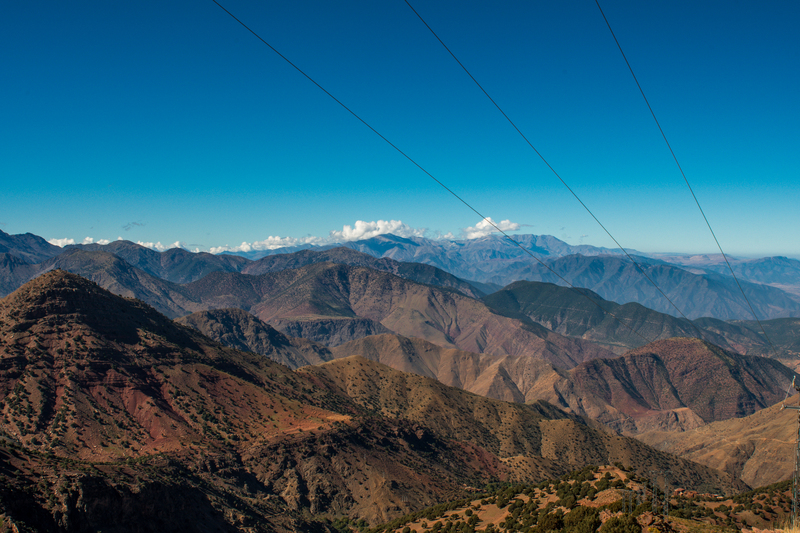 But sat at the foot of the Atlas Mountains as the sun early evening rush ensues, I can’t help thinking the real adventure lies on those peaks and the inaccessible trails that snake off into the distance. 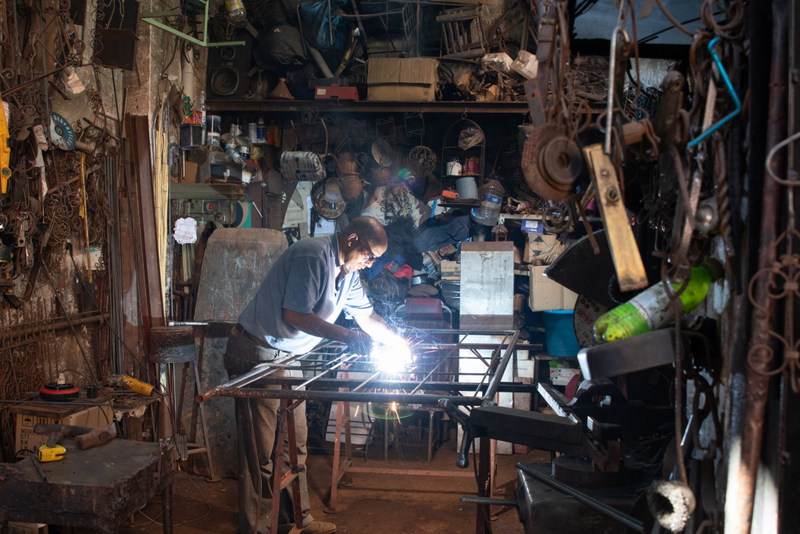 A version of this appeared on Vice Media’s Amuse travel channel. Check the link for more articles.